Virtual teams are increasingly a fact of organisational life, a part of our ever expanding socio-technical system. While many teams operate with ‘mixed modality’, part virtual part face to face, virtual teams can be defined as work groups which have some core members who interact primarily through electronic means and are engaged in interdependent tasks. On the positive side virtual teams are said help us surmount barriers of time and space; reduce office costs; increase productivity, because it allows individuals to focus with less distractions; are less likely to lead to groupthink; help attract a wider pool of job candidates; and are more environmentally friendly. On the downside, however, some people fear being out of the loop; others can feel isolated; employers can feel a loss of control; and Yahoo famously decided that the habit of homeworking had slowed the firm down and made it harder to have serendipitous meetings that can give birth to new ideas. Remember the basics. A virtual team is still a team, so arm yourself with a well-tested model of team effectiveness and use it to help structure your thinking. There are many models out there, just pick one that has served you well in the past. Being mindful about your team process is more important than which particular model you choose. Take that model and use it to assess how you’ve done, where you stand, and where you are going. Build Trust. Human factors, not technology, are key. Like any team, performance is built on the foundations of positive relationships and mutual trust. Get the team together physically early-on, if you can. Face-to-face communication is still better than virtual when it comes to building relationships and fostering trust. Then try to reconnect regularly (biannually or annually) if possible. 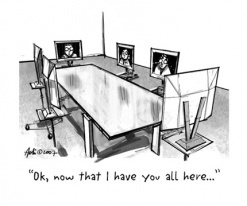 If you can’t get your team together focus on doing some virtual team building instead. Start each meeting with a check-in, having each member take a couple of minutes to discuss what they are doing, what’s going well and what’s challenging. Regular virtual team-building exercises are another way to inject a bit more fun into the proceedings. Whatever you decide, use the time to help team members get to know each other better, personally and professionally. Create a set of guiding principles for how the team will work. Good leadership is still important, but good management is key, everything needs to be more explicit to avoid misunderstandings. Coordination among virtual teams is inherently more difficult because people are not co-located. So it’s important to focus more attention on the details of task design and the processes that will be used to complete them. Simplify work tasks, ideally so they are assigned to sub-groups of two or three team members. Make sure there is clarity about work processes, with specifics about who does what and when. Do “after-action reviews” to evaluate how things are going and identify process adjustments and training needs. Don’t forget one-to-one’s. One-to-one performance management and coaching interactions with team members are a fundamental part of making any team work. Make these interactions a regular part of the virtual team rhythm, using them not only to check status and provide feedback, but to keep members connected to overall aims and objectives, and to highlight their role in the team.